For today, I would like to feature this magnificent painting for a simple reason: I like it a lot. 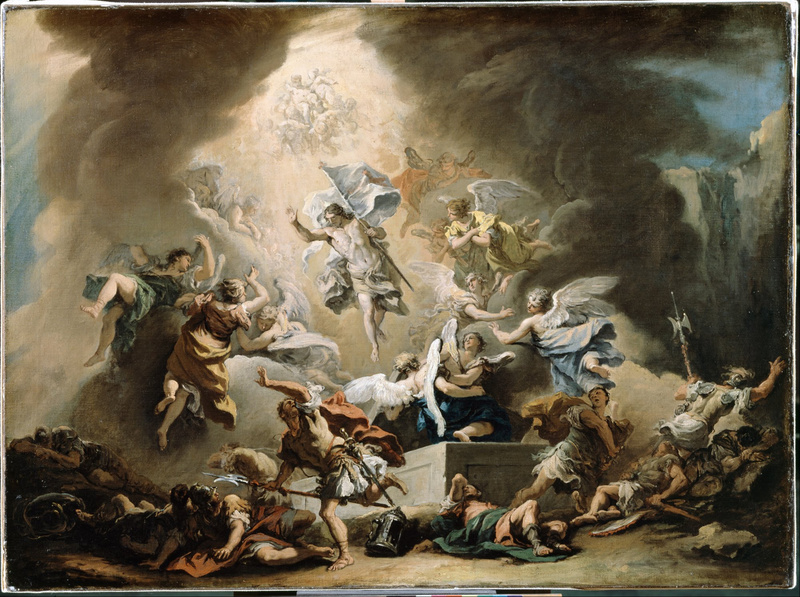 The Resurrection, by Sebastiano Ricci, c. 1715-16. Dulwich Picture Gallery, London, United Kingdom. In it, Christ comes out of the tomb in a fantastically glorious manner with light surrounding him while angels surround Him. He carries the flag of His Resurrection, a simple white flag with a red cross on it, and lets it unfurl. The guards, who were positioned all around His tomb, scatter into the darkness while brilliant light shines all around. In short: it is an absolutely magnificent scene that shows the drama of the Resurrection in a stunning way! Did I mention that the lighting is absolutely stunning? Anyway, I hope you’ve had a happy, blessed Easter day and hope that the rest of the Easter season is absolutely joyful! A very happy Easter to you and your family.I love this Baroque painting and yes the lighting is fabulous.